Our qualified and certified CCTV security systems technicians design, install and service your home or business CCTV system. This system can also be integrated to work with most intrusion and card access systems or security camera systems. CCTV security systems are a wise investment as statistics reveal a major reduction in the amount of crime being committed in areas covered by CCTV. 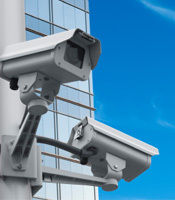 CCTV is one of the most cost effective methods for crime prevention and detection. Safety Net Security suggests you have all hazardous work areas monitored to ensure the security of your employees, and overtly or covertly monitor areas as a means of loss prevention and to compile recorded evidence against false accident claims. CCTV security systems can record and store information on-site or remotely monitored, and you can view your CCTV and security camera system via the Internet.